The outcome of the protests in one give the other a glimpse of what life might be like should it return to the mainland. The Hong Kong protests are waning. 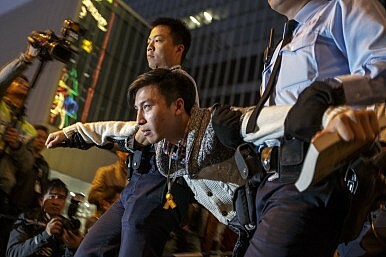 Last week prominent leaders of the movement Benny Tai, Chan Kin-man and Reverend Chu Yiu-ming, who founded the Occupy Central group that provided the catalyst for the protests, handed themselves into police. There were released without charge. Now, police are dismantling camps and making dozens of arrests. As the protests come to an end and a new day dawns on Hong Kong, it would be easy to say that they have achieved little, aside from bringing the city to a halt and frustrating Beijing in the process. In fact the ramifications of these protests extend beyond Hong Kong, across the water in Taiwan. On November 29, the ruling Kuomingtang (KMT) party was thoroughly trounced in local elections, losing even Taipei, usually a guaranteed victory. The drubbing has led president Ma Ying-Jeou to disband his entire cabinet, pending a major reshuffle. The KMT has long been credited with dramatically improving relations with the mainland. Previously one of the world’s most fragile geopolitical trip-wires, the last decade has been surprisingly peaceful. That the eyes of the world have been glued to a different set of disputed islands is testament to how stable relations between Beijing and Taiwan have been. The tide, however, is turning, and the waters are increasingly choppy. Taiwanese people are not happy with the KMT’s engagement with Beijing, and have spelled out their dissatisfaction via the ballot box. The KMT, which previously controlled 14 of the 22 municipalities and counties of Taiwan, managed to hold on to just six in this election. The elections coincided with violent clashes in Hong Kong, the last gasp of a dying movement. Hong Kongers, frustrated at not gaining the universal suffrage they believe to be enshrined in the basic law, staged mass protests and clogged major arteries within the city. Instead of causing cardiac arrest, however, the protests have proved largely to be an inconvenience, albeit a peaceful and artistic one. Hong Kong functions like a mirror, in which the Taiwanese can glimpse a reflection of themselves were they to ever return to the mainland. While there is no mention of universal suffrage in the Sino-British Joint Declaration, Hong Kongers have long held that true democracy was enshrined in their constitution and was forthcoming. That their hopes have been so spectacularly dashed upon the rocks provides a worrying precedent for Taiwan. Taiwanese youth, suffering a 14 percent unemployment rate, view creeping mainland influence anxiously. Recently, Taiwan staged its own protests, the Sunflower Movement, which saw young people occupying the legislature for three weeks in an attempt to prevent the passage of a cross-strait deal which would have allowed for greater liberalization of the trade in services. The occupiers were worried that this opening up of the economy would see an influx of cheap mainland labor and provide more opportunities for rich mainlanders to carve up the Taiwanese economy and further disenfranchise native Taiwanese. Events in Hong Kong now make increasingly close ties with the mainland seem even less attractive. Beijing, in holding steadfast and refusing any form of universal suffrage or true electoral reform, has proven categorically that one country will always trump two systems. For those who believed that the mainland was likely to liberalize and resemble Hong Kong, it is clear that Beijing instead hopes to retrench Hong Kong so it resembles the mainland. Staring into the mirror of Hong Kong, Taiwanese, who enjoy a vibrant democracy and a press ranked within the top 50 freest in the world, see a worrying future. Theorists have long predicted that one day Taiwan will inevitably return to the mainland. John Mearsheimer, the famous realist scholar, has noted that aside from the historical necessity to restore Taiwan to the mainland, it plays a crucial strategic role in China’s regional aspirations. Taiwan, as he describes, is effectively a giant aircraft carrier sitting off China’s coast, and if China is hoping to pursue its own Monroe doctrine in the Asia-Pacific, then bringing Taiwan back under Beijing’s control is of unquestionable importance. That this could be achieved peacefully now seems unlikely. Whereas before a glimmer of hope existed that ever closer ties between Taiwan politically and economically could one day lead to Taiwan returning to the mainland within the rubric of the one country two systems policy, this is now firmly off the cards. In this, Beijing has missed a trick. Beijing’s abject resistance to democracy in Hong Kong comes from its fear that democracy would spread north and undermine single party rule. This is unfounded. Mainlanders view Hong Kong as an anomaly, at once a part of China but also uniquely distinct because of its history as a British Colony. Mainlanders could have tolerated an increasingly democratic Hong Kong without assuming similar at home, especially having watched the failure of democracy to provide stable governance after the Arab Spring. Universal suffrage would have created a unique opportunity for Beijing. Not only could it have reaped the soft power advantages of appearing to be a responsible stakeholder in the international system, it would have shown that it keeps its promises, even against the odds. That the democratic process could have then been heavily influenced by Beijing by the way of fiscally supporting candidates and leveraging powerful business leaders and mainland personalities to lend their support would have been well within Beijing’s rights. It would be no less democratic than the perversion of the democratic system in the U.S. that Super PACs represent. Had Beijing relented and allowed true universal suffrage to flourish in Hong Kong, then Taiwan may have viewed Beijing with less skepticism, and been more open to a diplomatic solution to cross-strait tensions. Instead, any promise Beijing offers to Taiwan that suggests some degree of freedom that doesn’t exist on the mainland will be greeted with understandable disbelief. If Hong Kong really is a mirror for Taiwan, then as Dorian Grey discovered, the reflection is unsettling. That Taiwan could once again become one of the world’s geopolitical flashpoints is probably the saddest outcome of the Hong Kong protests. Even though the tents will soon be gone, Hong Kong’s umbrella movement is the harbinger of a real storm. Barclay Bram Shoemaker is a Shanghai-based writer. 6 Km From China, Taiwan's Kinmen Charts Its Own PathWhy Diplomatic Allies Matter to TaiwanWhat Happens After China Invades Taiwan?On Taiwan, the Honeymoon Is OverIs Trouble Brewing in the Taiwan Strait?